Cannot have attachments. Immune to player card effects. 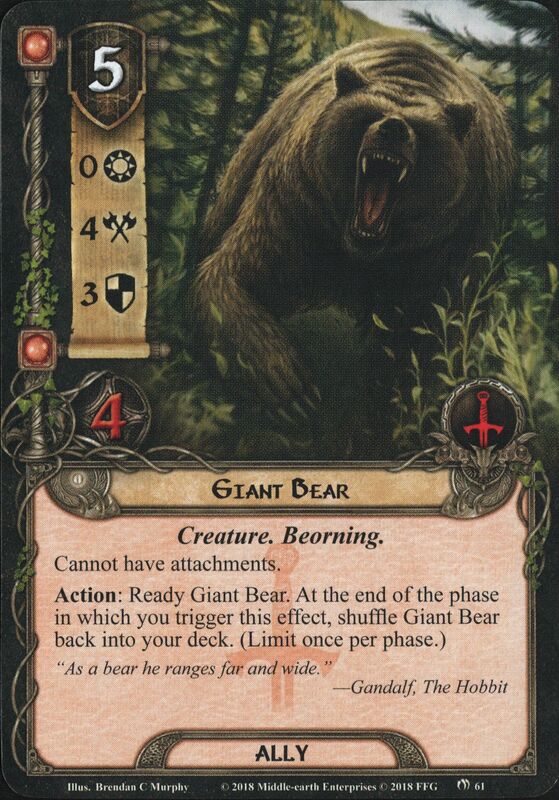 Beorn does not exhaust to defend. 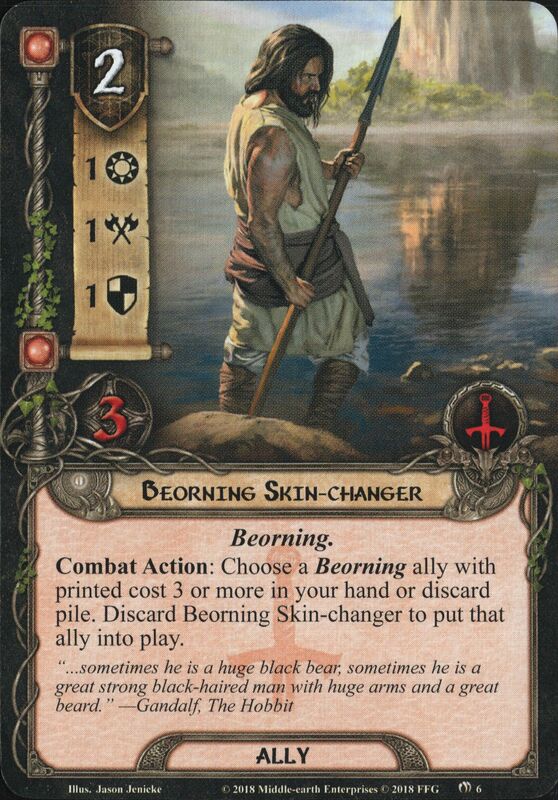 Combat Action: Choose a Beorning ally with printed cost 3 or more in your hand or discard pile. Discard Beorning Skin-changer to put that ally into play. Action: Discard Beorning Beekeeper from play to deal 1 damage to each enemy in the staging area. Response: After Beorning Guardian participates in an attack that destroys an enemy, discard Beorning Guardian to place X progress on a location, where X is the destroyed enemy's printed Threat. Response: After a Beorning character is declared as an attacker or defender against an enemy, that enemy gets -2 Attack and -2 Defense until the end of the phase. Action: Choose a player. Heal all damage on each hero controlled by that player. 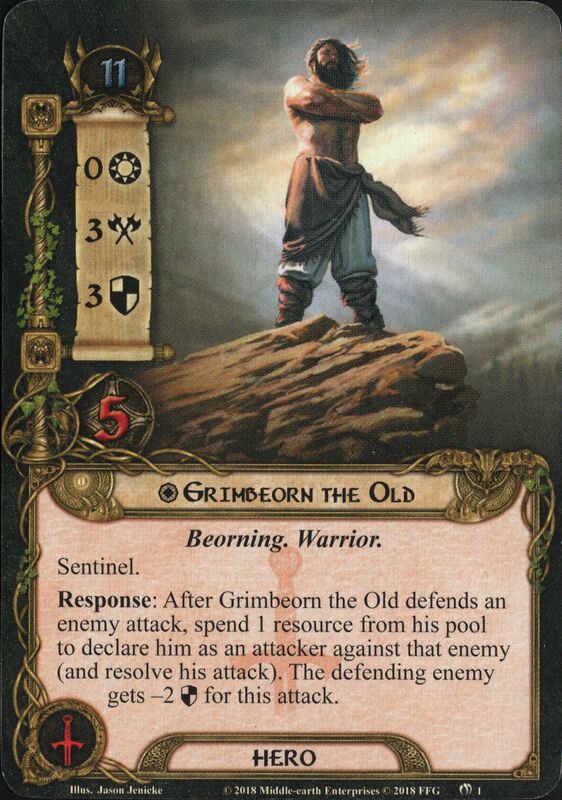 Response: After Grimbeorn the Old defends an attack, spend 1 resource from his pool to declare him as an attacker against that enemy (and resolve his attack). The defending enemy gets -2 Defense for this attack. Grimbeorn the Old does not exhaust to defend against Troll enemies. If Grimbeorn the Old has 8 or more resource tokens on him, he joins the first player as an ally. Action: Spend 1 Leadership resource to place that resource on Grimbeorn the Old. Setup: Add The Carrock to the staging area. Remove 4 unique Troll cards and 4 copies of the 'Sacked!' card from the encounter deck and set them aside, out of play. Then shuffle 1 'Sacked!' card per player back into the encounter deck. Forced: After placing the 7th progress token on Grimbeorn's Quest, The Carrock becomes the active location. Discard the previous active location from play. When Revealed: Add Rob and Bob to the staging area. 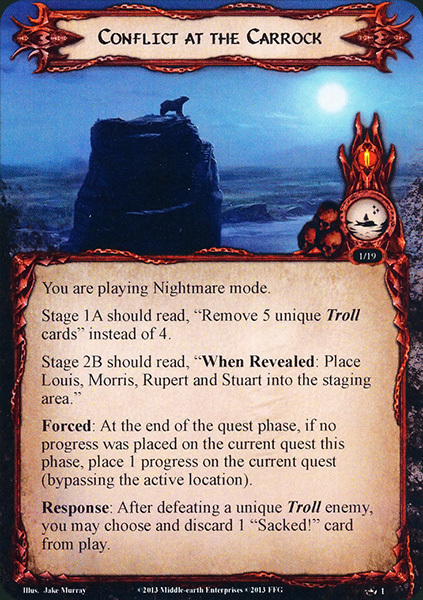 Then, each player must search the encounter deck and discard pile for a non-unique Troll enemy and add it to the staging area, if able. Shuffle the encounter deck. When Rob and Bob have been defeated, the players have rescued Grimbeon the Old from certain death, and won the game. You are playing Nightmare mode. Stage 1A should read, "Remove 5 unique Troll cards" instead of 4. Stage 2B should read, "When Revealed: Place Louis, Morris, Rupert and Stuart into the staging area." Forced: At the end of the quest phase, if no progress was placed on the current quest this phase, place 1 progress on the current quest (bypassing the active location). Reponse: After defeating a unique Troll enemy, you may choose and discard 1 "Sacked!" card from play. Begin with the standard quest deck and encounter deck for the Conflict at the Carrock scenario. 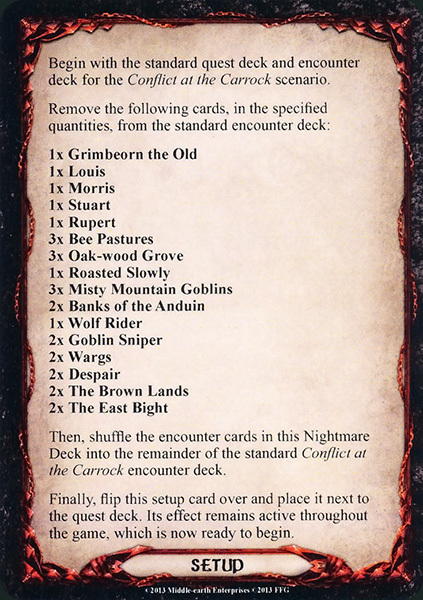 Remove the following cards, in the specified quantities, from the standard encounter deck: 1x Grimbeorn the Old 1x Louis 1x Morris 1x Stuart 1x Rupert 3x Bee Pastures 3x Oak-wood Grove 1x Roasted Slowly 3x Misty Mountain Goblins 2x Banks of the Anduin 1x Wolf Rider 2x Goblin Sniper 2x Wargs 2x Despair 2x The Brown Lands 2x The East Bight Then, shuffle the encounter cards in this Nightmare Deck into the remainder of the standard Conflict at the Carrock encounter deck. Finally, flip this setup card over and place it next to the quest deck. Its effect remains active throughout the game, which is now ready to begin.